Jeff Cable's Blog: Finally! I just finished my video of the super cute penguins in South Africa! Finally! I just finished my video of the super cute penguins in South Africa! It took me a little bit of time to build this video, but I think you will enjoy it. 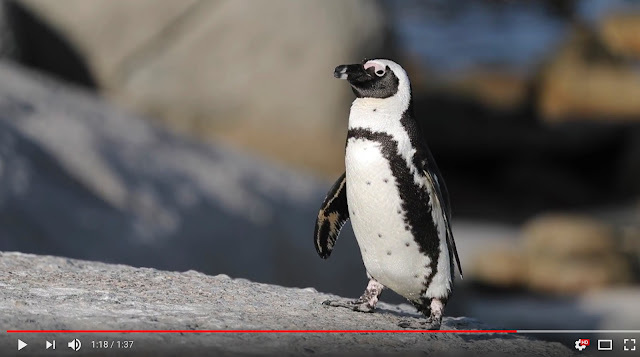 This is a video compilation of the the penguins in Cape Town, South Africa. As you all know, I am a still photographer and have never professed to being a videographer. But with the awesome video quality of the Canon 1D X Mark II, I just could not help myself. These penguins were just so darned cute that we actually made two trips to Boulders Beach to capture stills and videos of these little tuxedo clad adults and their youngsters. Click on the image above to launch the video. I hope you enjoy watching the video as much as I did creating it. Ali was so right - the end of the video is the best, when the little guy/gal gets swept over by the wave. Loved the video. A shout out to teachers!